The 1960’s were a truly strange era in Marlon Brando’s film oeuvre. After the box office bomb of “Mutiny on the Bounty” as well as six other unsuccessful films that alternated between light entertainment fluff (“Bedtime Stories”, “The Countess of Hong Kong”) and films aligned with Brando’s increasing passion for social political causes, (“The Ugly American,” “Burn” which will be discussed next) Brando’s Hollywood stock began dropping considerably. In “Reflections in a Golden Eye,” John Huston’s sad, creeping murmur of a tale based on the Carson McCullers’ novel, Brando plays U.S. Major Weldon Penderton at a Southern Army Base during the 1940’s. Married to the ravishingly gorgeous Lenora, played by Elizabeth Taylor, Penderton becomes obsessed with a new young private in his charge. Brando stated in his memoir “Songs My Mother Taught Me” as well as in various interviews that he thought this was his best film performance of all time. This dubbed, Italian financed affair about infamous mercenary Sir William Walker playing both sides during the Caribbean slave-revolt against the British is sloppy, overacted and ham-fisted in its anti-Imperialist polemics. That said, when Brando is onscreen, he is truly on fire and frighteningly good. What can be said that hasn’t already been said about the film that is almost universally regarded as the greatest motion picture of all-time? For our purposes it’s worth noting that Marlon Brando, after a decade of bombs, was now officially considered box office poison. 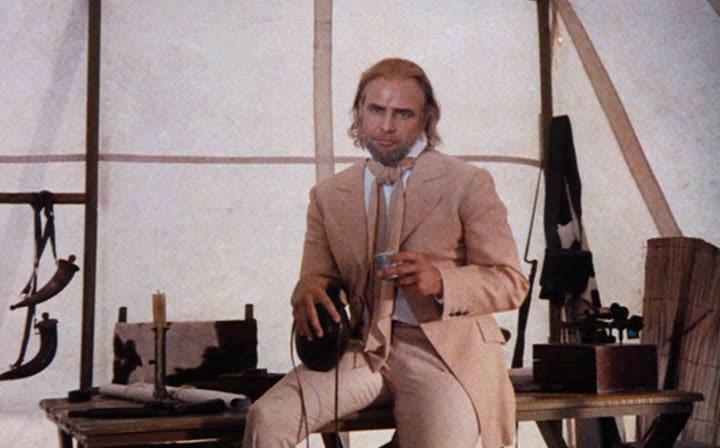 Only due to the persistence of the young Francis Ford Coppola, and Brando’s willingness to do a make-up screen test at his own home for Coppola to show the studios, did his casting happen. 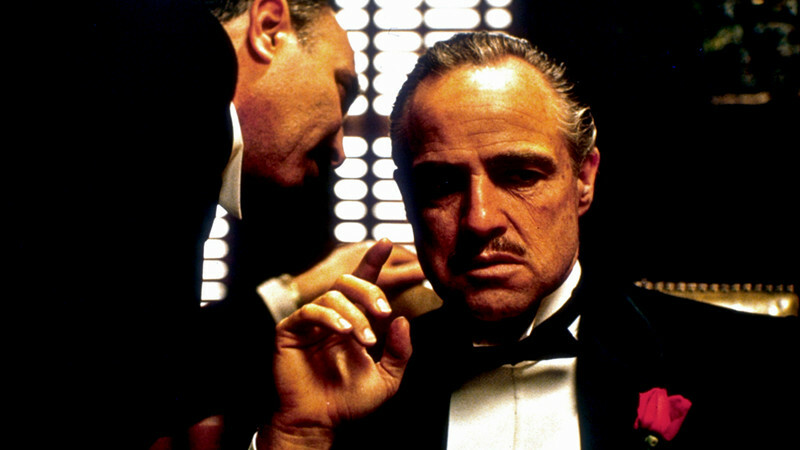 Paramount executives swore that if Coppola even mentioned Brando’s name again for the role of Don Vito Corleone, they would fire him from the project (Paramount wanted Ernest Borgnine or Danny Thomas.) Then Coppola showed them the screen test of “an actor” he was interested in for the role. They flipped for it, and when they were told it was Marlon Brando, they couldn’t believe it. The rest is history. His performance is still shocking to behold in that he appears in less than half of the film, yet towers over both this film and its incredible, equally brilliant sequel like all father’s do over their sons. How perfect that the man that single-handedly launched a new approach to screen acting would win his second Oscar as the father figure to the next generation of “method” actors in Al Pacino, James Caan, John Cazale and Robert Duvall, with the heir apparent Robert DeNiro portraying the young Vito Corleone in the sequel. Launching his career like a comet as a stage actor in the 40’s, revolutionizing film acting in the 50’s, and then adrift with a self-loathing hatred for the art of acting for much of the 60’s, Brando would make two of his most lasting contributions to the art of Cinema in 1972 with “The Godfather” and “Last Tango in Paris.” It is the artist at his most naked – literally, emotionally and spiritually. In “Tango,” Brando plays Paul, a former actor and sometime Journalist living off the finances of his French wife who has recently committed suicide in the apartment building they owned. Paul was based in part on Brando’s own life, with much of the improvised dialogue biographical in nature. The film was rated NC-17 in America for Paul’s engaging in a “no names” sexual contract of sorts with the young Maria Schneider. The film sparked worldwide controversy and has as many detractors as it does champions. 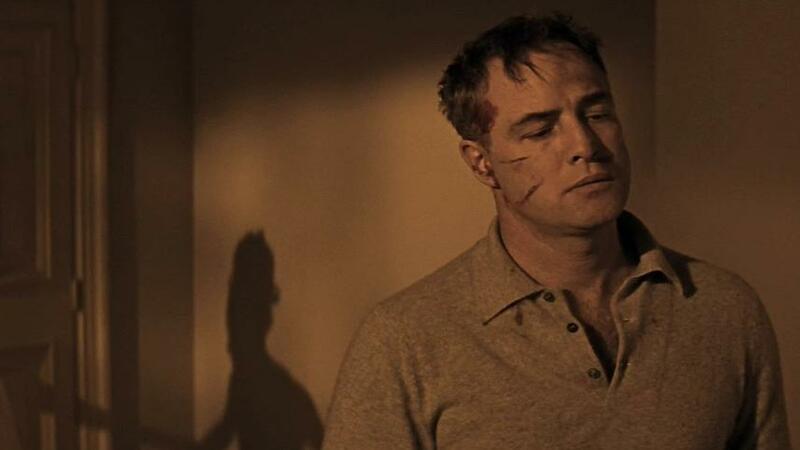 As for all the snark-laden talk of butter, sodemy and a ballooning Brando this film can often inspire, the scene where he berates his dead wife on her funeral bed, then crumbles before her is almost too intimate to bear. 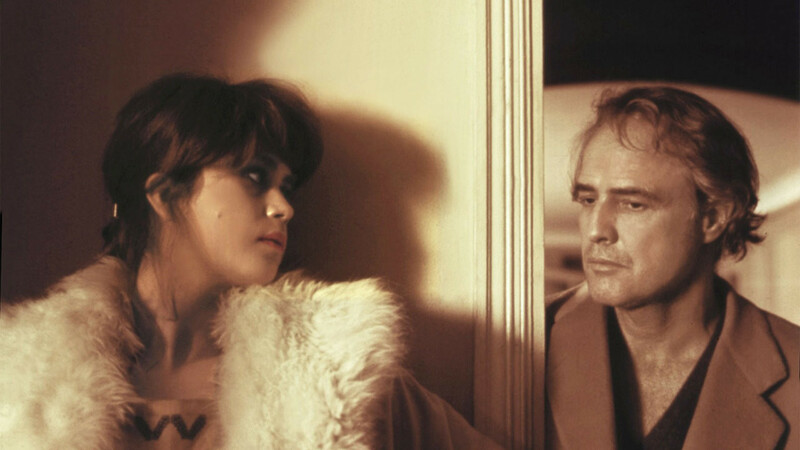 In interviews with Maria Schneider as well as with Brando, both revealed that they had felt manipulated, tricked and in a sense raped by Bertolucci for how deeply he had exposed the actors. Brando swore he would never allow himself to be this naked, this emotionally exposed ever again. Add this to Brando’s most eccentric performance list, alongside “Reflections of a Golden Eye” and “Apocalypse Now” (to be discussed). 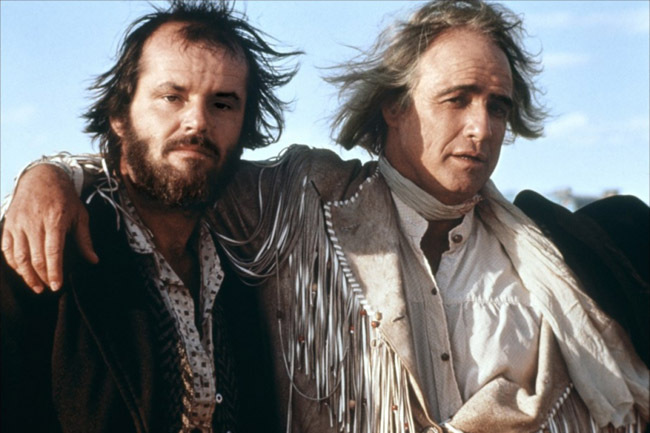 This western, featuring fantastic performances by Jack Nicholson and Harry Dean Stanton as cattle rustlers in Northern Montana, just barely hobbles along until Brando graces the screen and blows the entire enterprise sky high. Brando plays the mysterious Regulator, a killer for hire whose main targets are rustlers, and then if he feels like it, the people who hired him in the first place. He starts out with a very authentic Irish Brogue and goes by the name of Robert E. Lee Clayton. But his costume is Native American inspired. Then in a different sequence he tricks the rustler Randy Quaid by donning the clothes of a Reverend and speaks as if he’s from Kentucky, with a gob of chewing tobacco jammed into his cheek for good measure. Every moment he’s on screen is genuinely thrilling, frightening and at turns, sickeningly hilarious. By the film’s end, when he whips a homemade throwing star of sharpened sticks at the head of Harry Dean Stanton, Brando does so while wearing an old woman’s dress and prairie bonnet. Brando’s bravaura performance here is not without its reason, as he becomes an almost physical embodiment of chaos, the chaos the wealthy cattle owner had invited upon himself by taking the law into his own hands by hiring The Regulator to kill Nicholson and his fellow rustlers. His eccentric, risk taking choices as an actor here can be seen as a cinematic precursor to Heath Ledger’s Joker in the “The Dark Knight” as well as Johnny Depp’s ensemble of chaotic characters in practically every movie since “Once Upon a Time in Mexico.” Admittedly, the film is quite a slog through its first hour, but if you can make it through, the last hour is incredibly tense as it segues into almost a Western-Horror tale as Brando’s terrifying Regulator begins hunting the rustlers down, one by one. Overweight, under-prepared and insanely brilliant is Marlon Brando as Colonel Kurtz, the man with an impeccable military record who has left his ranks to form his own jungle army near the Cambodian border in Francis Ford Coppola’s epic Vietnam tale, “Apocalypse Now.” Based on the Joseph Conrad novel, “Heart of Darkness,” about a man hired to find the wayward explorer Kurtz and “terminate his command,” Brando was supposed to show up for one week of work, physically fit and having read the Conrad novel. Instead, he showed up heavier than he’d ever been, and had not turned a page of the famous book. Coppola’s answer was to dress Brando in black, film him in almost perpetual darkness, and hire a double for times he needed to see a fuller, more imposing body shot. He and Brando then proceeded to explore what would then happen when Martin Sheen’s Captain Willard finally did meet Kurtz. One week, turned to two, turned to six, with the meter running. And the result was impossibly brilliant. 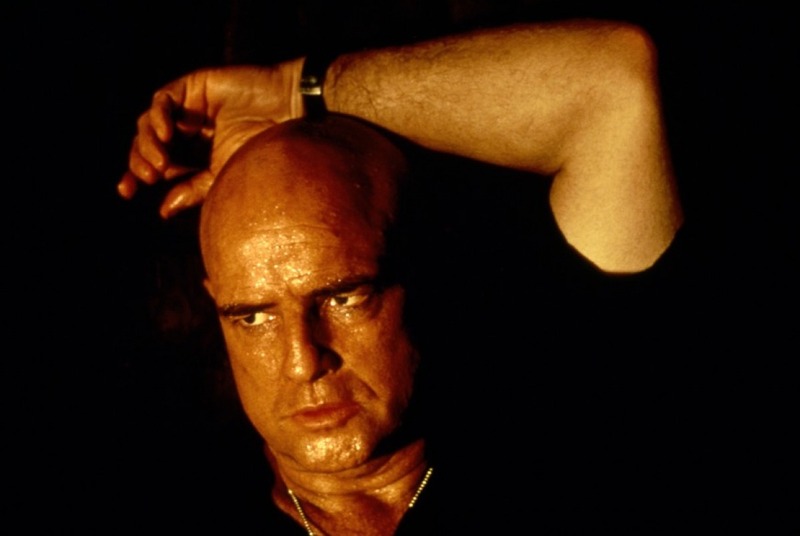 While only appearing in less than twelve minutes of screen time, Brando’s Colonel Kurtz hangs over the entire three-hour epic like a giant humid specter of doom. Sending up his own “Godfather” persona sounded like the worst idea at the time, and after an early cut, Brando was quoted as saying as much. 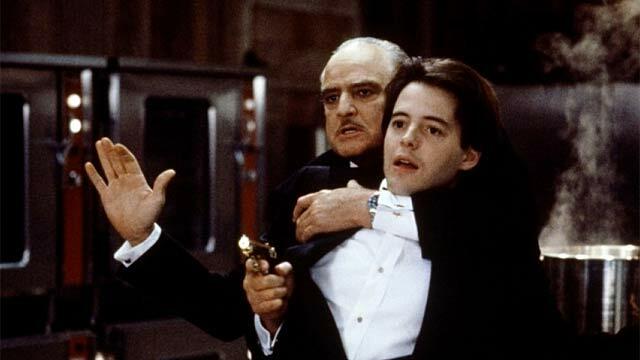 But in the end he rescinded and was very happy with this delightful screwball comedy co-starring Matthew Broderick as an NYU film student who gets mixed up with a slightly daft, walnut cracking version of Don Corleone in the form of the man they “based the character on,” Don Carmine Sabatini. With the exception of “A Dry White Season” made in 1989, and 1990’s “The Freshman,” Brando did not work for most of the 80’s and most of his work in this period was in mostly unwatchable dreck, films made hurriedly for the paycheck to aid in covering his son’s legal fees his shooting and killing and his sister’s boyfriend (Brando’s daughter, Cheyenne, would later kill herself on his Tahitian island just as “The Freshman” was finishing production). 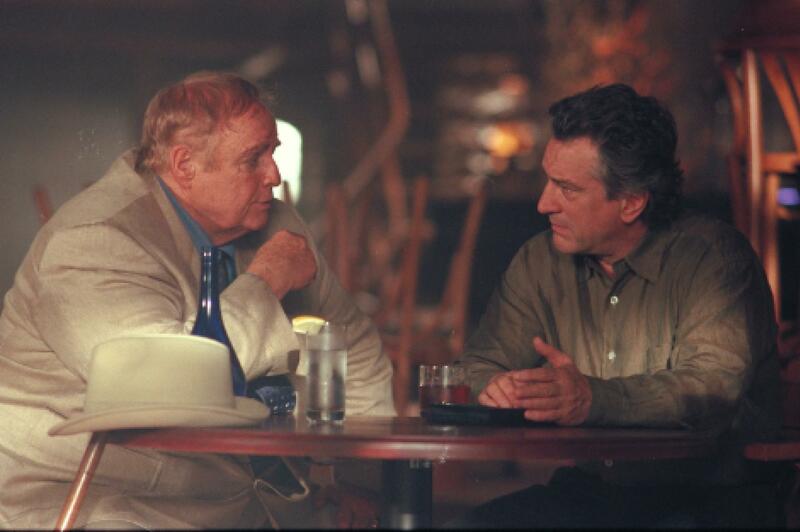 It was truly a gift then, to film lovers and Marlon Brando fans everywhere, when he made “The Score” co-starring his heir-apparent to the Greatest Living Actor throne, Robert DeNiro (as well as, some might say DeNiro’s heir-apparent, Edward Norton.) While certainly not a great movie, it’s not trying to be. Instead, director Frank Oz gave us a serviceable throwback to the heist films one might have seen as the B picture on a double-bill back in the days when Brando was just beginning his acting career. At accomplishing this, director Frank Oz was entirely successful. Brando plays Max, the one time thief, now set-up man and financial backer to Robert DeNiro’s expert thief who, as is always the case in these tales, wants to do one more job and then go legit as the owner of his Montreal Jazz Club, where love interest Angela Basset sings the night away. It’s a thoroughly entertaining heist picture that plays by all the numbers of the genre, and hits them efficiently, no muss, no fuss. Plus, you get to two excellent scenes between the titans of cinema, Brando and DeNiro, the latter of which is clearly having genuine fun playing off Brando’s ever-eccentric improvisations. True Brando fans may argue as to why this list has not included Brando’s follow up to “Streetcar” – “Viva Zapata!” – as essential viewing. Directed by Elia Kazan and written by John Steinbeck, this rousing, moving epic about Mexican revolutionary Emilliano Zapata is certainly an excellent film, for Brando’s Zapata as much as for Anthony Quinn’s Oscar Award winning performance as Zapata’s brother. However it falls in the awkward category of dated, racially inappropriate casting, which has become problematic for this particular writer upon subsequent viewings (one can say the same for Brando’s performance as, ahem, a Japanese Man named Sakini in the 1956 production of “The Teahouse of the August Moon”). Not to stand on politically correct ceremony, true Brando aficionados and those curious filmgoers should consider “Viva Zapata!” worth viewing. Also worth a look: The Fugitive Kind, A Dry White Season, Roots: The Next Generation, Meet Marlon Brando, a short documentary by the Maysles Brothers, Brando: A TCM Original Documentary. Author Bio: Jeremy Sklar is a writer-director-producer for Satori!films where he splits his time between New York, Los Angeles and Chicago. Sklar co-directed, produced and wrote the action-comedy feature “Freerunner” starring Sean Faris and Seymour Cassel as well as created the web horror series “Hollywoodn’t.” Recently Sklar served as writer and segment producer of Executive Producer Chris Rock’s FX show “Totally Biased.” He is currently in pre-production for his next feature “Air Disturbance.” He can be reached via his website at www.jeremysklar.com.